Directors/Screenplay – Dean DeBlois & Chris Sanders, Idea – Chris Sanders, Producer – Clark Spencer, Music – Alan Silvestri, Production Design – Paul A. Felix. Production Company – Disney. The Galactic Federation captures the mad scientist Dr Jumba Jookiba and sentences him to prison for creating an insanely ferocious creature that only has an appetite for destruction. The creature, Experiment 626, is sentenced to exile on Earth. It lands on one of the Hawaiian islands where it is duly ends up at an animal shelter. It is then adopted by the young orphan Lilo Pelekai who thinks it a dog and names it Stitch. Lilo, herself someone who does not fit in at school, is raised by her sister Nani. Lilo is in danger of being taken away from Nani by child services who perceive the home situation as unmanaged. The presence of the even more out-of-control Stitch adds even further to the chaos but Lilo becomes greatly attached to him. Meanwhile, the Galactic Council has sent Dr Jookiba to Earth with orders to eliminate Stitch. 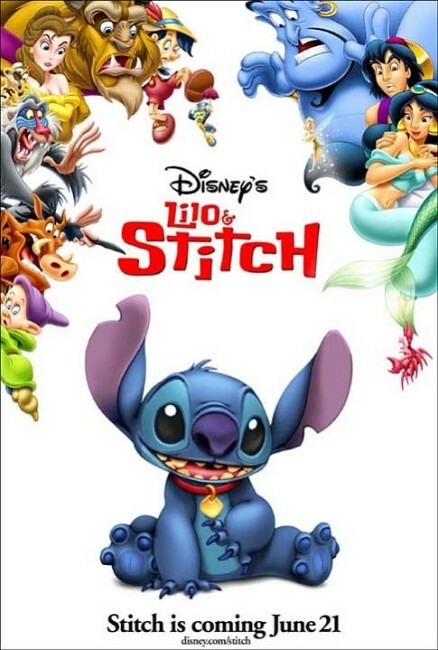 Lilo & Stitch is an animated film from Disney, although one that left many audiences somewhat indifferent and most critics scratching their heads (as was the case with most Disney animated films of the 2000s). It was however one of the few modest financial success that the studio had during a decade of mostly animated flops. As with several Disney animation releases around the same time – The Emperor’s New Groove (2000), Atlantis: The Lost Empire (2001) – it befell a mixed advertising campaign. The trailer, for example, looked utterly whacko, featuring the characters invading the ballroom scene from Beauty and the Beast (1991) – a scene that doesn’t feature in the finished film – while the poster told one nothing at all about the film. While Lilo & Stitch produced a collective scratch of the head upon the parts of audiences, it is itself not an unlikable effort. It eventually emerges as is a variant on E.T. – The Extra-Terrestrial (1982) – the diminutive stranded alien creature and the lonely kid who form a friendship, the alien being pursued by various authority figures that want to capture it. Although Lilo & Stitch is more an E.T. where the title creature has been replaced by one of the malicious balls of fur out of Critters (1986). Or else an E.T.-copy like Gremlins (1984) conducted in reverse – one that starts out with one of the malicious post-midnight Mogwai and proceeds to transform it into a cute and cuddly ball of fur. The difficulty that most people seemed to have had is that Lilo & Stitch is an atypical Disney film. While most Disney films hold family as a sacred cow above all else, Lilo & Stitch wilfully celebrates family dysfunctionality. The heroine is an orphan who definitely has some social adjustment issues, her sister is raising her in a less than entirely Youth Services-approved manner – indeed, a major subplot involves the sister’s fight to stop Youth Services taking Lilo away from her care. The Stitch character is an adorable golliwog of misdirected aggression – sort of a Critter with permanent ADD. He has some nifty gimmicks including putting its feet in its mouth and rolling around the floor in a ball; using a talon and a hinged jaw as a makeshift record player; and, most appealingly, building a model city and then doing Godzilla impersonations and stomping about and smashing it up. The film’s central theme that ohanu means family and is all inclusive and ultimately all-redeeming is none too surprising, but in truth the characters here have more in common with the oddball eccentric outsiders that inhabit the world of a Tim Burton film – in particular, The Nightmare Before Christmas (1993) – than they do the characteristic wholesomeness of a Disney film. 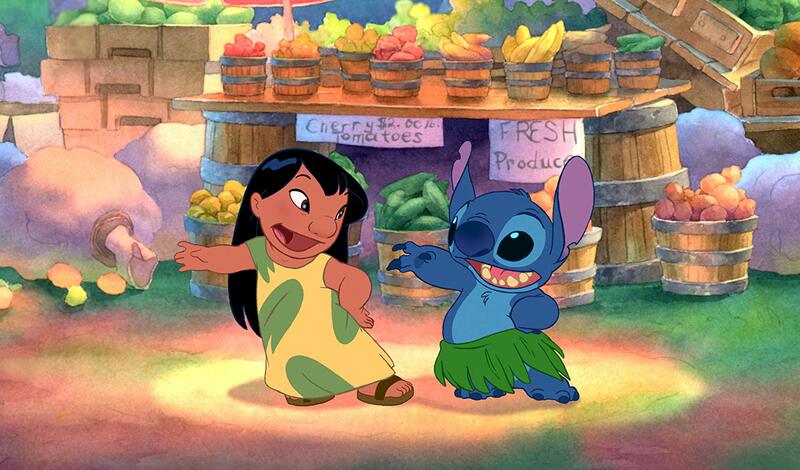 Perhaps the oddest aspect of Lilo & Stitch is its ethnic backdrop, focusing on Hawaiian culture. In the early 1990s, during their reconstruction phase, Disney films – in particular Aladdin (1992) and The Lion King (1994) – were accused of pandering to racial stereotypes. Disney then started making scrupulous efforts to embrace different racial/cultural groups – Pocahontas (1995) with its revisionist focus on American Indian history, Mulan (1998) and its historical Chinese setting, The Emperor’s New Groove and its gonzo adaptation of Aztec culture, the Inuit culture of Brother Bear (2003), the African-American themed The Princess and the Frog (2009) and Pacific Island culture in Moana (2016). The results are oddly interesting. There were three video/dvd released sequels Stitch! The Movie (2003), Lilo & Stitch 2: Stitch Has a Glitch (2005) and Leroy & Stitch (2006), while the film was later expanded into an animated tv series Lilo & Stitch: The Series (2003-7). Directors Dean DeBlois and Chris Sanders subsequently went onto make How to Train Your Dragon (2010) for DreamWorks Animation. Sanders later co-directed The Croods (2013) for DreamWorks, while DeBlois solo directed How to Train Your Dragon 2 (2014) and How to Train Your Dragon: The Hidden World (2019).